This vehicle is located in Raglan, Waikato. 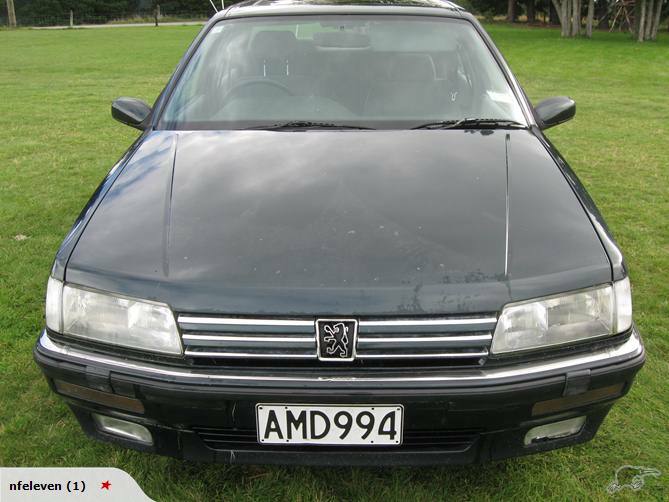 Wanted to buy: A Peugeot 505 station wagon with a WOF and live registration in Auckland or upper half of the North Island for a good one. A top New Zealand drag racer was beaten by a 65-year-old at the New Zealand Drag Racing Association (NZDRA) National Finals at Fram Autolite Dragway in Meremere on Sunday 28th March 2010. 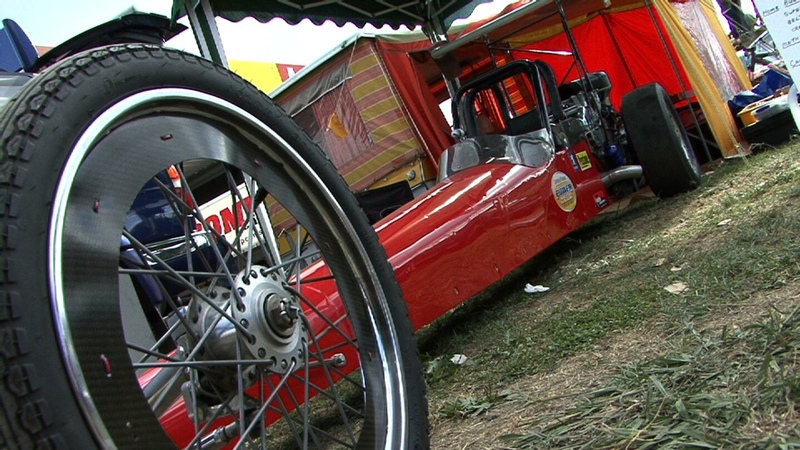 Veteran drag racer Trevor Watson drove his 1967 Peugeot powered dragster into the C2 Competition Class finals to take on event favourite Robbie Ward. Ward says he has had a successful 2009/2010 season, taking nearly two seconds off the New Zealand record with his newly built Nissan turbo-charged chassis. However, in the final race Ward lost his concentration and was disqualified for leaving the line six hundredths of a second too early. His car still ran a 7.6 second quarter mile and reached 143.09 mph (230.27 km/h). “I’m absolutely kicking myself that I didn’t win it. It was in the bag and I blew it”, said Ward. Watson, an experienced drag racer says nearly 50 years of reading the lights contributed to his win. His bright red dragster ran a 9.285 second quarter mile and reached 137.16 mph (220.73 km/h). Watson says he comes back every year for more than just the racing. Article by Geoff Bell. Originally published in Te Waha Nui. Reproduced by permission. Car-data.com has two versions of the 605 turbo listed, the earlier 146hp model and the later 150 hp model. This car is described as a 1993 model first listed in 1994, indicating that it should be the 146 horsepower variant. This is backed up by the engine code embedded in the chassis number, RGY and RGX are the two versions of the XU10J2te engine and this car should have the RGY engine. Data specific to this car is available on Carjam and if you are considering purchasing this car (or any other car) you should at least click here to check for an updated report or preferably buy a report that shows any securities issued against the car. The information provided in this report is provided by third parties. While CarJam has taken all reasonable care in preparing the report we are unable to guarantee its accuracy and no responsibility is assumed by CarJam or its agents for errors or ommissions in this report. The report was created and is only valid as at 2012, April 25th. Although Peugeot has a long history of using turbochargers in their racing cars and diesel engines, finding a factory fitted turbo in an older petrol powered road car is a rare occurance in New Zealand. There was of course the fabulous Peugeot 205 T16 (200 produced for homologation) and Peugeot 405 T16 (1061 produced), both of which allowed Peugeot to perform remarkable feats in motor racing in the 1980’s. However, based on the limited information available from NZTA, there is no indication that there are any road legal versions of these models currently in New Zealand. Left hand drive countries got the Peugeot 505 Turbo in both wagon and sedan form. The US spec 505 with the 2155cc turbo engine put out significantly more power than the US version of the 505 V6, but only just beat the euro version of the V6. It seems that the turbo sits right where the steering column goes on a right hand drive 505, so this probably explains why they were available in LHD only. 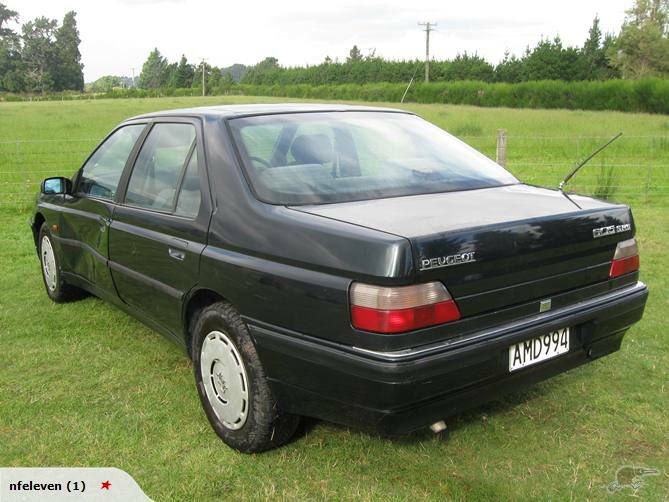 And then up pops a Peugeot 605 Turbo on Trademe! – Time to do a little investigation. 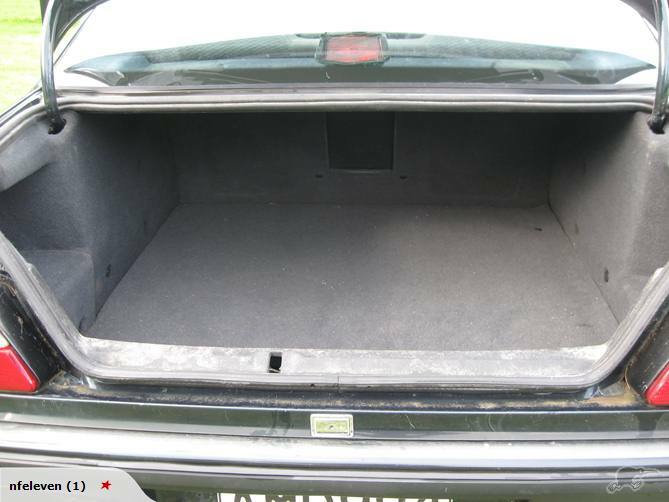 In February 2005 there were around 169 Peugeot 605s with live registration. Of these, 12 were shown as having a 2 litre engine and the remainder having the 3 litre V6. But by May 2011, the number of 605s with live registration had reduced to around 81 and only 8 of these were four bangers! 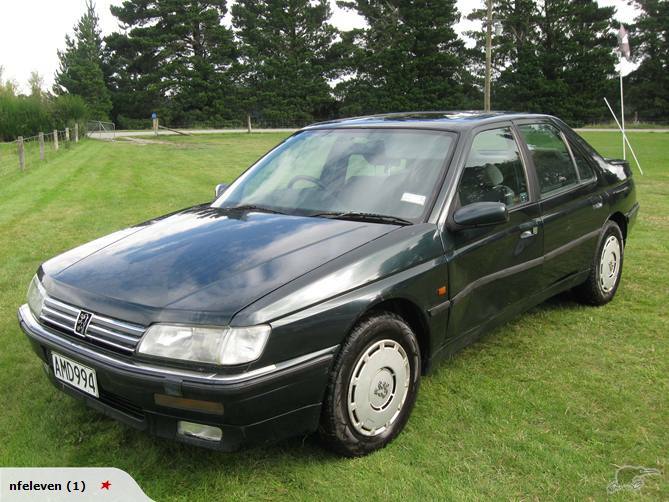 Sure enough, the 605 Turbo on Trademe matches the NZTA information – 1993 605 SRTI, 1998 cc petrol engine first registered in NZ in 2002, colour green. 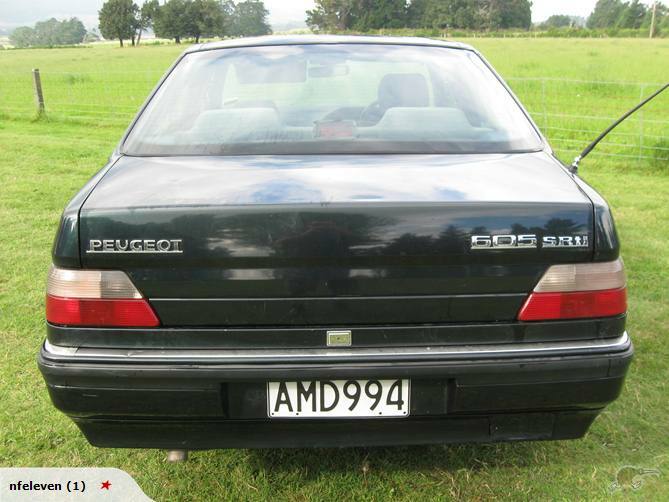 1993 Peugeot 605 SRTI,141,000mlsThis car is all complete with rego on hold. Has 2 litre turbo petrol engine with 5 speed manual box. Engine broke cambelt when idling hence the reason its parked up.Some doors have been kicked in but otherwise its straight and tidy. 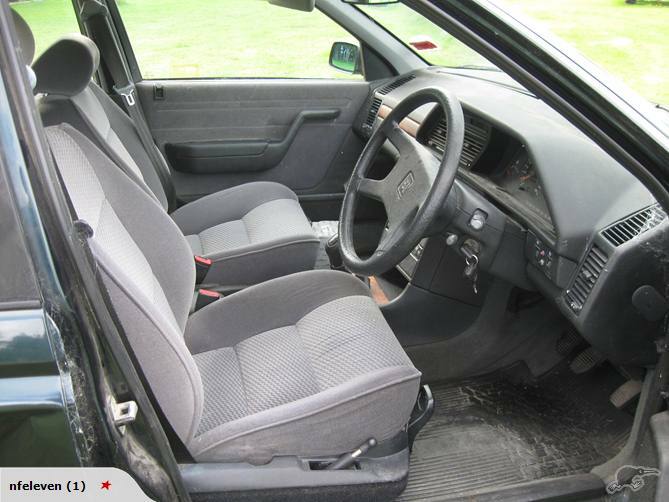 The lever on the side shows the driver’s seat to be height adjustable, and it appears that the seat is also manually moved forward and backwards – something I much prefer to electric seats!. Just imagine being able to match the colour of your car to your outfit, or your mood…. ps, don’t forget to check out the anagrams for the Head of Innovations – Flora Polis! Posted in Peugeot RCZ	| | Comments Off on What colour is your Peugeot RCZ (today)? The black 4 door 1957 Peugeot 403 Sedan was up for Auction at Turners Damaged Vehicles in Penrose on 29th March 2012. It was listed as having an 1800 cc engine, however the standard engine size for a 57 sedan was only 1468cc. Condition was described as rear damage but still driveable with a key still available. The Autotrader add showed a price estimate of $1,500 and 68 views of the page. It seems likely that this is the same car advertised in the March 2012 Peugeotex. That car also had rear damage, and as Vero considered it too expensive to fix, they wrote it off and deregistered it! The owner was able to find most of the parts to complete the repair and about $1,000 of chassis work was required. A quick check indicated that there were just over 30 cars listed as Peugeot 403s with live registration in early 2011, but the figure may be a bit higher as a few of the Peugeots of that era did not have their model numbers listed. It looks like this might have been one of the earliest 403s still with live registration prior to the accident. There is one 1955 model, a possibly one other 57 (the model is not specified) before this one. Hopefully it went to an enthusiast. The car was again up for sale at Turners on 5 April 2012. A phone call to NZTA revealled that it was deregistered on 30 March 2012. What happened? Perhaps it sold, was deregistered and then the buyer failed to complete the deal? Unfortunately, the result is the the original 1957 plate is no longer valid for the car, a significant loss in value in some people’s view. The Power of the Marque is theme. The Peugeot Club will be showing a selection of member’s 406 coupes. The 2012 Interclub Gymkhana is being hosted by the Peugeot Club. Proceed to the end of Cato-Peart Road where you will directed to the appropriate paddock. The Gymkhana is an annual event involving a number of activities which may be scored by time, accuracy, or what ever the organisers can come up with. As well as points for individual placings, points are tallied for the two clubs and count towards the Tricolore Trophy.